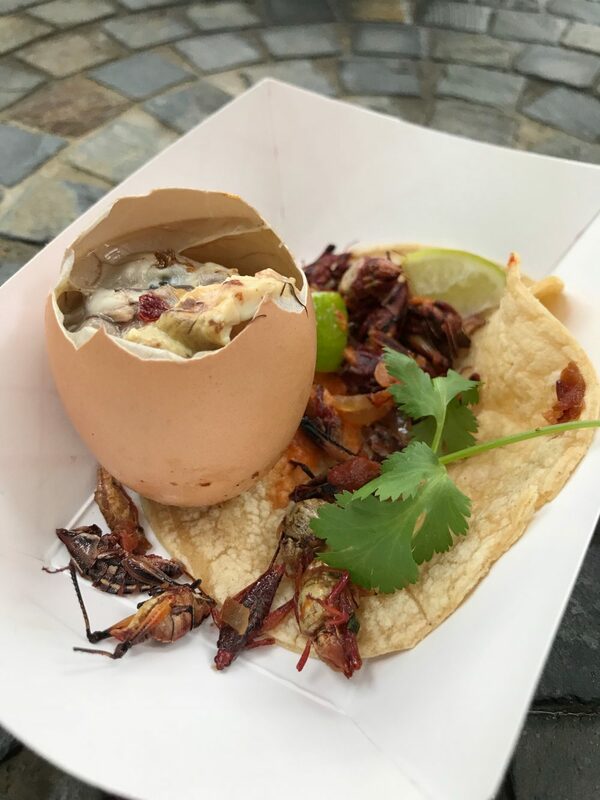 Grasshopper tacos for lunch? Sure, I could use some protein anyway. 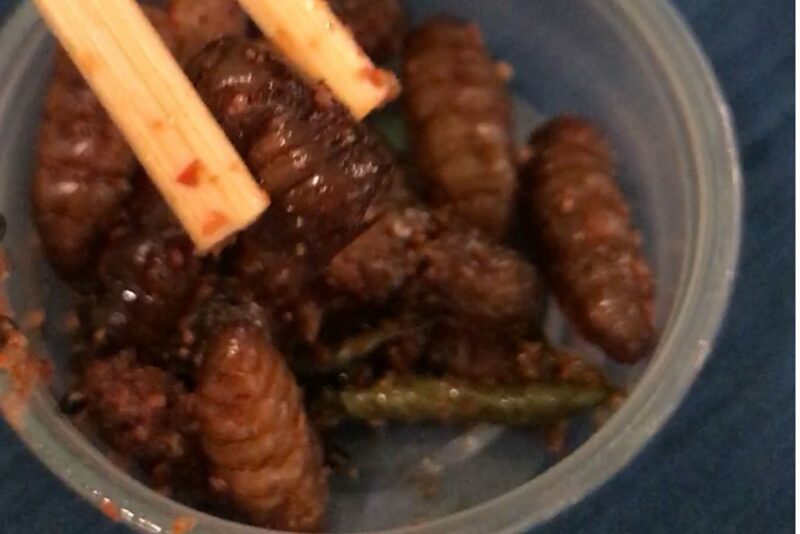 What about some fried silkworm or ant egg larvae soup? If that’s not your cup of tea, there’s always beer to wash it down and fermented sweet rice for dessert. 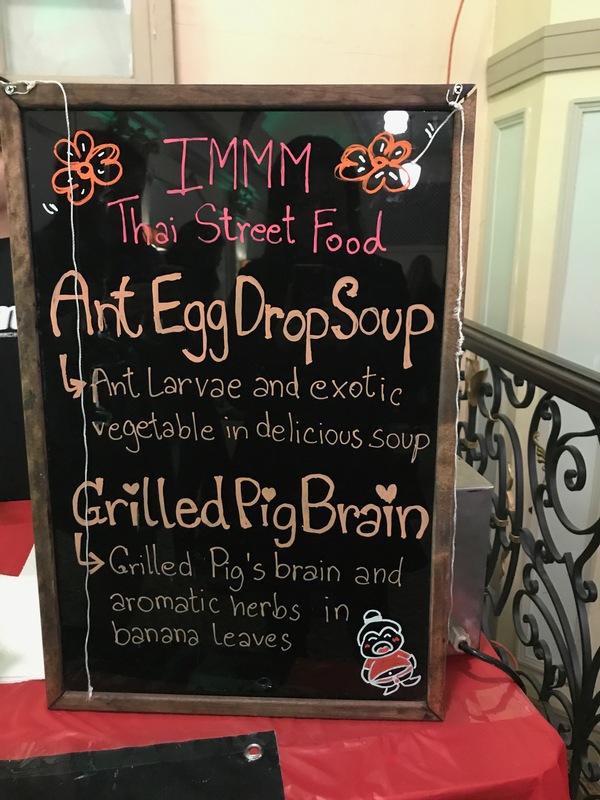 These were just some of the things you could find at the Strange Foods Festival 2. 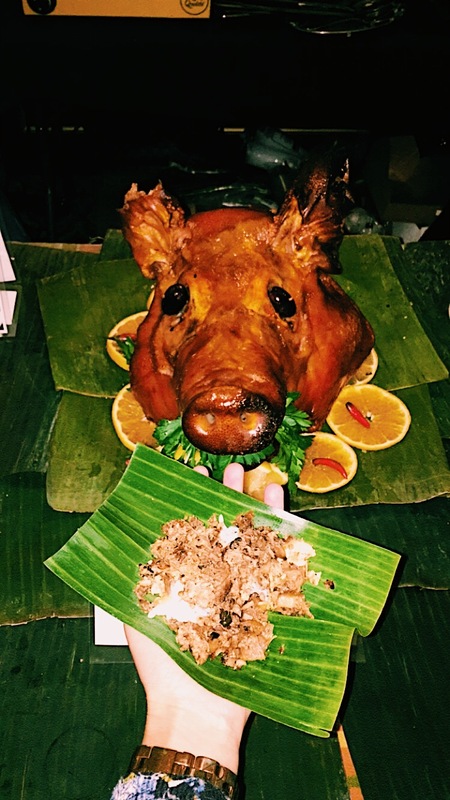 The festival is a yearly gathering showcasing some of Chicago's more unique and diverse food gems, along with beverages, live music, and performances. 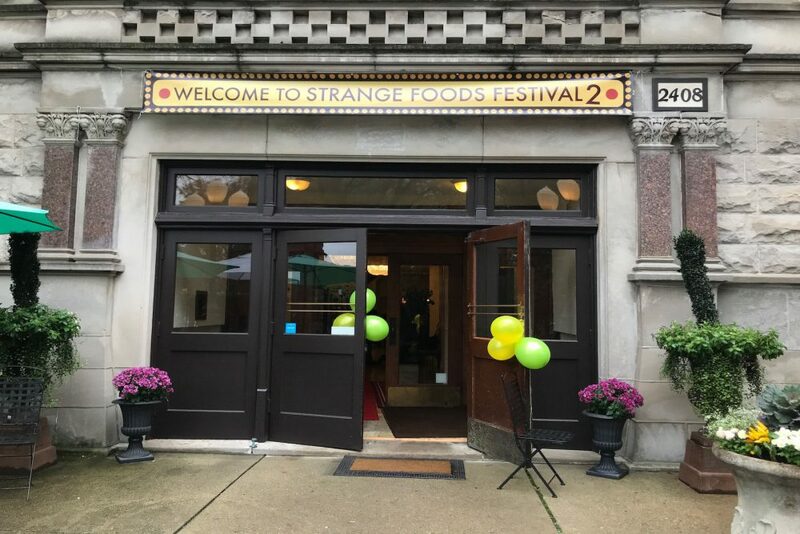 This year's event was held at the historic Stan Mansion in Logan Square. Chicago is so lucky to have such an amazing food scene, it's impossible to try and know it all. So a festival like this, which brings some of the lesser-known delicacies to one place, is a must-go! I’ll be the first to admit that although I love food, I’m not the most adventurous eater. Still, sometimes you have to dig deep inside yourself for courage you never knew you had and just...eat. 2:00 pm: I arrive and meet up with a small group of friends to explore the festival. 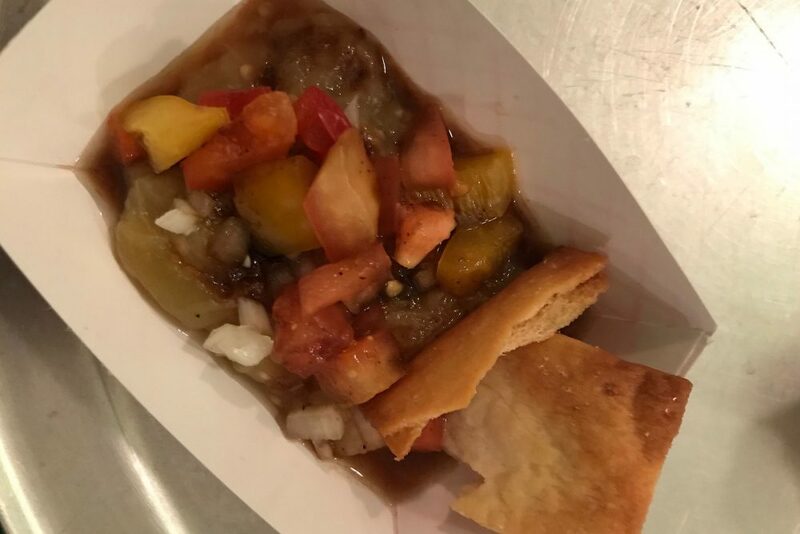 We take a walk through before we start, although my friend does grab some tripe ragu from Animale (this dish is the eventual winner of the festival). She says it’s spicy but good, and wants to go back for seconds. I tell her to hold off because we have bugs to eat! 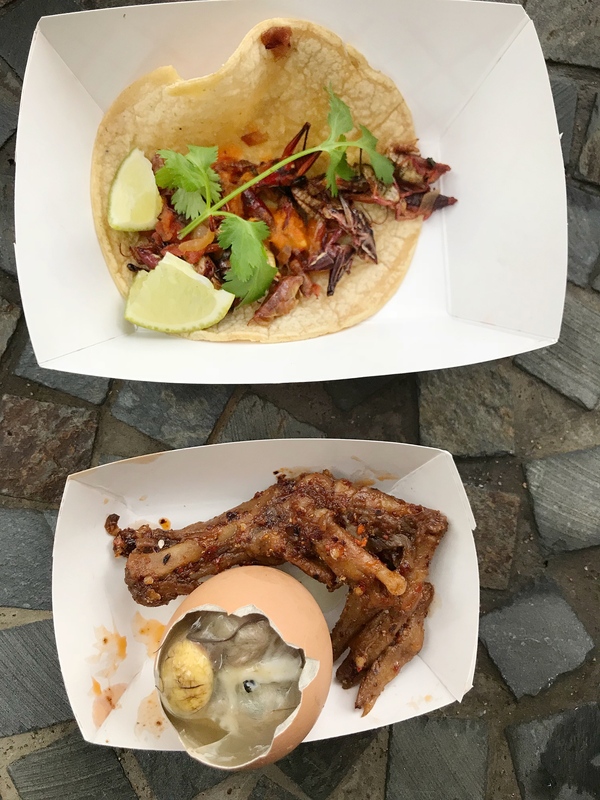 2:15 pm: We gather up grasshopper tacos (Kie Go Lanee), balut egg (Kubo Chicago), and duck neck/feet (A Place by Damao). I take a tiny bite of grasshopper leg. The little hairs latch onto my tongue! As I think about this one of my friends casually reaches over and pops a whole bug into his mouth. 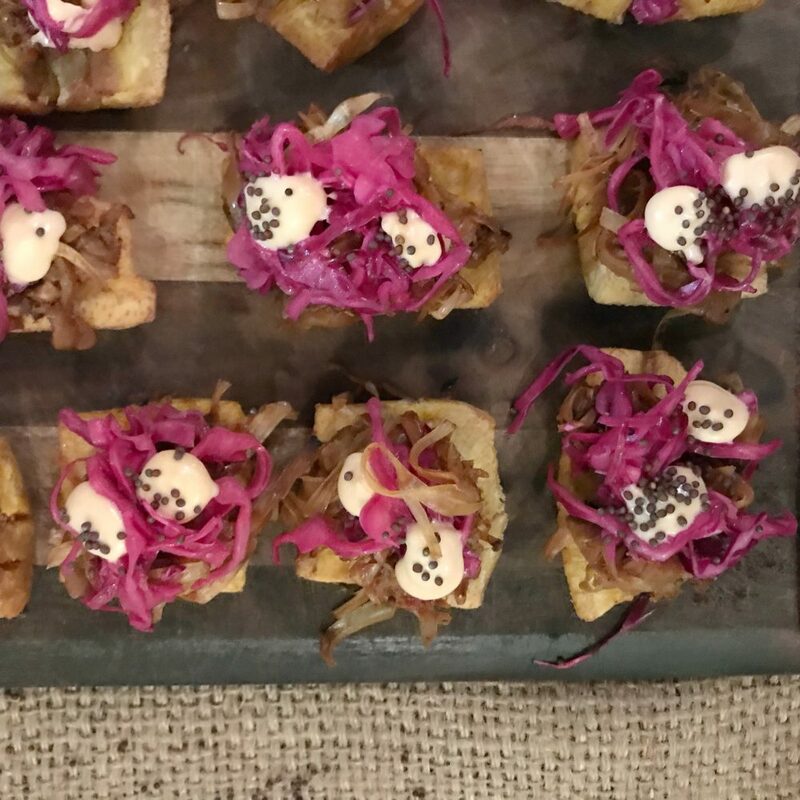 I stare, bug-eyed for a moment (har har) then realize as the actual food blogger between us I can’t be outdone. I reach for the balut egg. Balut is a bird embryo, half developed in the egg. Why did I start with this? I angle the egg for a picture and the juice spills over onto my hands. I take a tiny nibble of what I think is the yolk...hmm. Not bad. Similar to scrambled egg, mostly. I dig in for more. 2:45 pm: As a collective party we decide alcohol might be helpful first, and head up to the bar for wine and Singha beer. 3:00 pm: After downing a glass of wine as fast as I can, I feel more prepared. I wander around trying baba ganoush from Honey Doe (really good!) and Jackfruit jibarito from Rad Larder, (also really good!) We set our trays down by a group of guys who have just finished trying fermented sweet rice and the ant egg larvae soup from Immm Rice. I ask him how it is. 3:20 pm: Need more booze. 3:29 pm: I feel great! 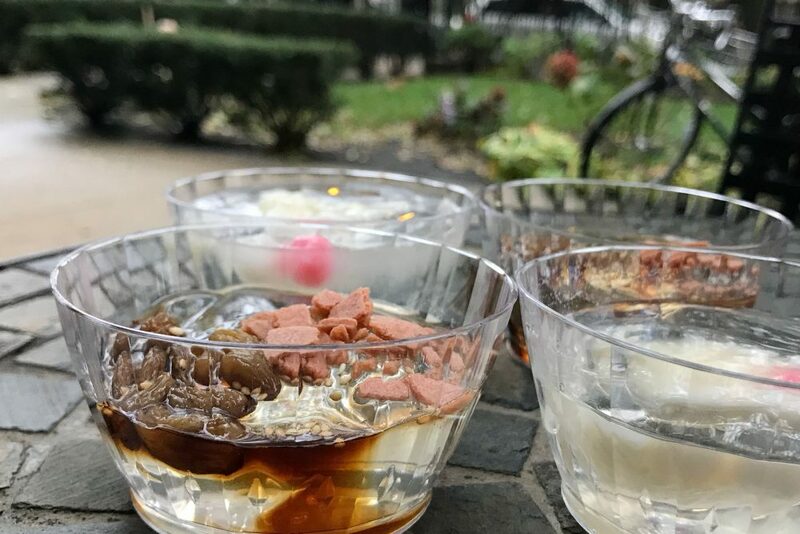 3:30 pm: We head outside with four cups of water jelly from A Place by Damao for a picture. I really like this jelly! Very subtly sweet, it jiggles in my mouth and makes me laugh. Or maybe that’s the wine. 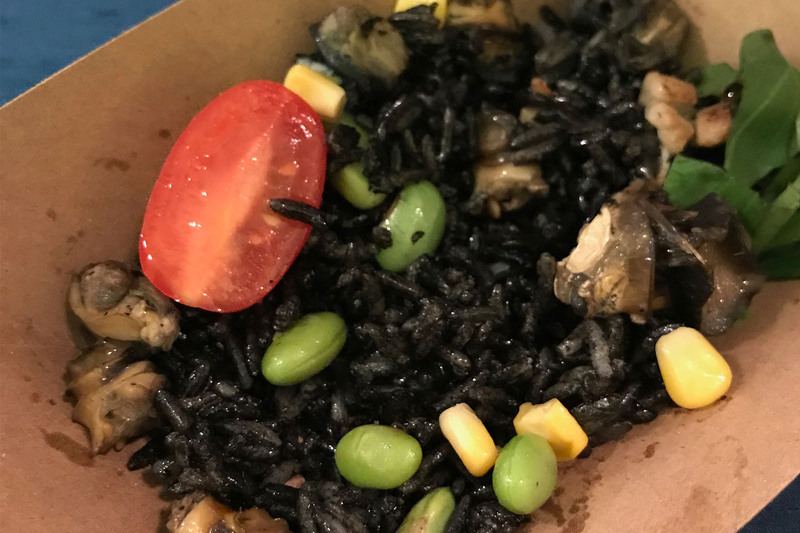 3:45 pm: My friend and I grab some squid ink fried rice with snails from Bites Tapas and beef tongue poke from SuChi Sushi. I look at the fried silkworms at the Bites Tapas stand and they look at me. Feeling brave, I pop one into my mouth. I make a face but then realize...my hang up is mostly mental. It’s been fried so crispy it doesn’t really taste like anything but spices. Crunchy spices. I wouldn’t make a meal of this but it’s definitely not the worst thing I’ve ever had. 4:00 pm: We’re ready to go and my stomach is somewhat confused but oddly still hungry. Who wants to go get pizza? So all in all it was a pretty fun day. Although there are lots of people with braver stomachs than me, who can happily wolf down the balut eggs and bugs like it was nothing, I learned that I can’t. I can only give you an account of my own experience, which was a day for trying new things and having fun with friends. And isn’t that part of what good food is all about?